Today I feel very blessed to be able to spend our last Christmas in Victoria as a family. My children are my greatest joy. May each one of you be able to spend time with the ones you love. Last month I was scheduled to do a demonstration for the Nanaimo Chapter of the Federation of Canadian Artists. This demonstration was to be on how I do my poured watercolors. I spent a few weeks preparing the process of which includes 5 pours in all. Since most of the pouring process involves waiting for things to dry, I decided to speed it up by doing 5 different versions of the same painting. Each painting, however, has something a little bit unique about them. 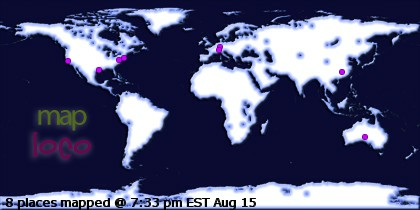 Unfortunately, on the day of the demo we had a snow storm. I decided it would not work for me to drive the 1.5 hours over the mountain pass to Nanaimo for the demo. So, now that classes have ended I decided to finish a couple of them. The first one sold to a friend as soon as it was done and now I need to finish the rest. 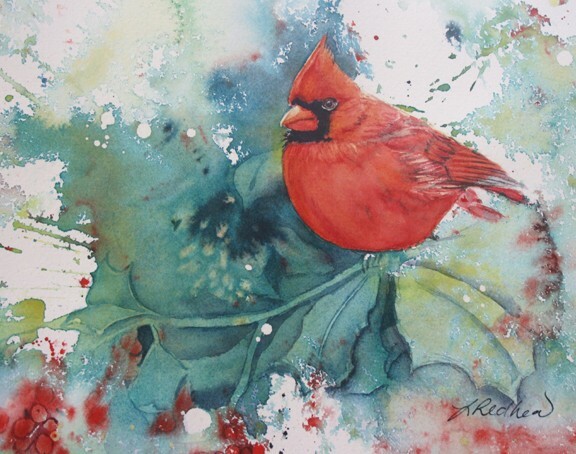 Featured in the Art of Day Holiday Art Show and Sale. Painting image is 14x20". It is matted and framed with UV Plexiglas. Framed size is 22x28". Painting is also available unframed. 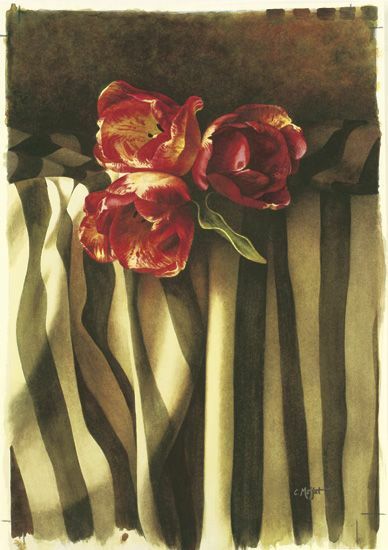 This beautiful painting will be package with care and shipped via UPS. Item will be shipped within 2-3 days of purchase. To celebrate my move to Vancouver (and to clear out some paintings so I don't have to pack them) I am having a Holiday/Moving sale from now until January 15, 2011. Everything in my Etsy shop is now 20% off. Please use coupon code MOVINGSALE2011 at checkout to get this fabulous offer. There is also free shipping to Canada and the U.S. on several of the original paintings. Payment on Etsy is through PayPal which accepts most major credit cards. Other items not found in my shop are also on sale. These original paintings and prints are reduced 10-20%. If you live in the Victoria area, you are welcome to visit my studio and select a painting or two before this offer expires. Please contact me before you do so though! I might be in a sea of boxes if you don't. If you are not able to visit my studio, please contact me via email about any of the paintings you may be interested in purchasing. Plus I will be packing everything up after January 15. My heart is sad and my head is spinning. Yet I am excited ﻿all at the same time! My husband accepted a position at a company in Vancouver, BC. That means that we are moving from Victoria and the island soon. Moving here 4 1/2 years ago from Boston was the hardest thing I had ever done. The first 2 years were a nightmare not because of the place but because of several things that happened in my personal life. There were too many big changes at once. Then I started to paint and teach again. My position at the Monterey Centre was literally an answer to my prayers. I am still amazed by how it happened. Since then, I have come to love this place and the people. I have met so many amazing people and feel blessed by my associations. It will be difficult to leave. However, we are happy that my husband has found steady work and has been offered a great position with an architectural firm. Yeah! It will be hard for me to start over and to build all new clientele in Vancouver. It will also be hard for our children to move from their friends and such a great neighborhood. I know that it will work out in time and it is for the best. I am excited by the prospect of new opportunities. In the meantime, I will continue to teach at the Monterey Centre in January and I will be back on the island to conduct workshops. 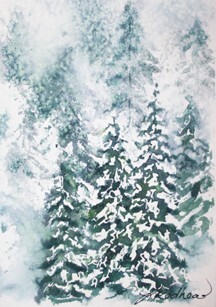 This past Sunday I taught a fun class on Painting Holiday Cards in Watercolor. This idea came about because some friends of mine make their own cards every year. In fact, they start them early in the year and spend countless hours on these little gems. I have been fortunate enough to be a recipient of these annual cards and cherish each and everyone. They are now one of the things I most look forward to at Christmas and are reserved a spot on the mantle. These friends have since inspired me to make my own cards. I really don't have the time to make as many cards as I would like, so I have chosen to only paint 10-20 cards/year. Then I got this great idea to teach how to paint holiday cards because who doesn't love a handmade gift? My goal was to show some techniques for simple winter landscapes that my students can then use on their own cards. 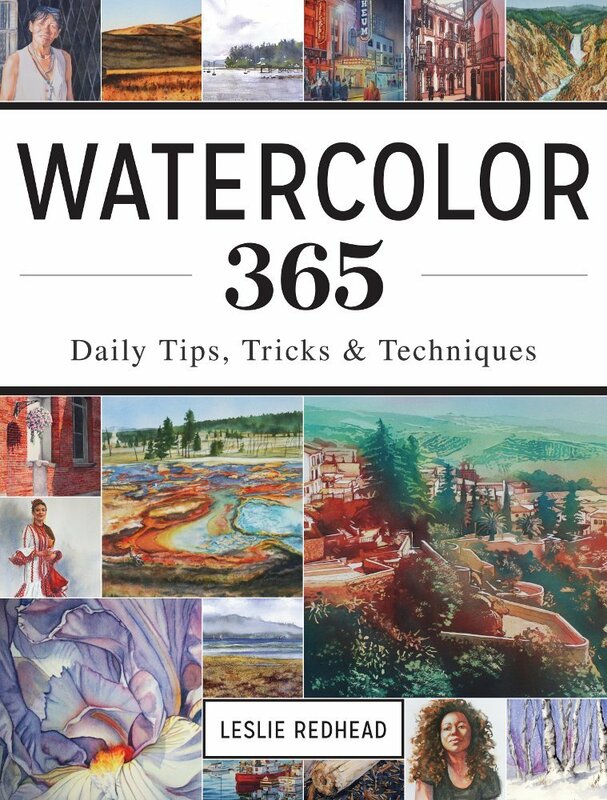 Once they have these techniques mastered, they can then paint their own cards with different compositions and colors. The above painting is just one example of what I taught. This year is the 100th year celebration for the local elementary school- Willows Elementary. 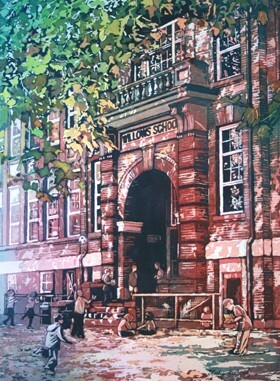 To commemorate this event, it was requested that I do a painting of the school. This painting will be donated to be hung in the front entrance. It will also be made into notebooks and other items that will be used to raise money for the school. This past weekend was my big studio tour and it certainly felt like it was a prelude to the holiday season. Most of the island was covered in snow. It did snow in Oak Bay but fortunately it didn't stay. Lucky for me, the show was still on. Although some art connoisseurs may have been detered by the weather, many friends and art lovers made it out to my home. ﻿So, thank you to those of you that were able to make it. Now it is time to prepare for Christmas and the holiday shopping season. Several of my paintings are available through my Etsy shop, Artistically Connected, and Madrona Gallery. 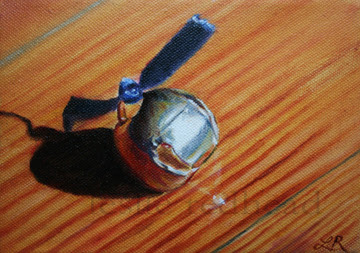 Since I had enjoyed painting my other jingle bell in oil so much that I had to do another one. This one has a green ribbon instead of blue. The first Jingle Bell is part of the Small Treasures III show at the Coast Collective Gallery that opens this Thursday. The weather should be much warmer by then so hopefully you will make it out that way to see some of my work. For more information about the Small Treasures III show, please visit the Coast Collective Gallery. 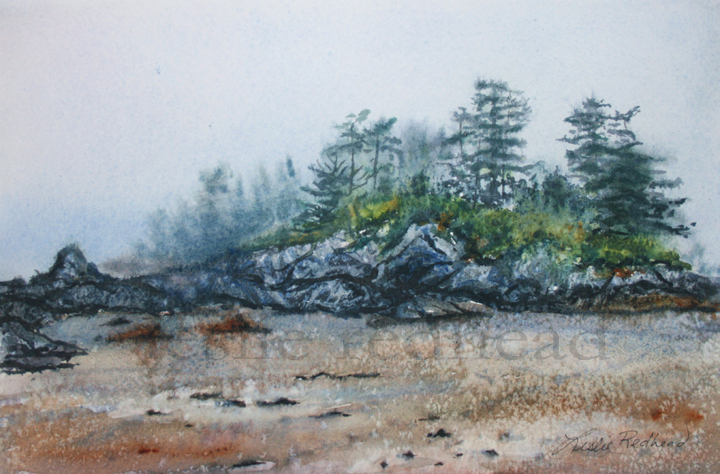 The Oak Bay Fall Studio Tour is this weekend. 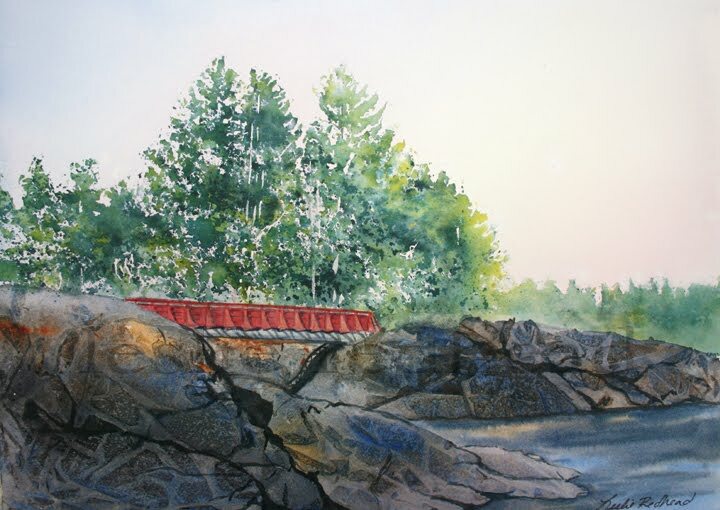 Twenty local artists will be opening their homes and studios to the public. It is a wonderful event to start the holiday shopping. My painting of Olive Trees and Poppies is featured in the brochure (I'm #1 on the brochure) and it will be on sale along with many other paintings. Prices range from $100 - $2000 for originals. Notebooks and cards will also be on sale. The show runs both Saturday and Sunday, 12-4:30pm. My studio will be open at 12 on Saturday. However, I will not be there until 2pm. Other people will be there to greet you if you are not able to come after 2. More information can be found at Oak Bay Recreation. Notebooks with images of my paintings will be on sale at the studio tour. Prices are $8.50 for the small (6x9") notebooks and $12 for the large (8.5x11") notebooks. Field of Blue Camas is a painting that I demonstrated for my Fun and Free watercolor class. It is a view of the Garry Oak trees and the beautiful camas that grows in Anderson Hill Park. Atmospheric colors of yellow, red, and blue are washed across the paper. Then the sky and sky holes are masked out so that paint can be splashed and splattered without worrying about it getting into the sky. Once the tree has been painted, the mask is brought up and the tree limbs are added. This week has been another busy week. My studio tour is this coming weekend. I am frantically getting ready for it as well as continuing to teach. I also overbooked my weekend (not my fault-honest!!!) and I will also be demonstrating my pouring technique Saturday morning before the studio tour opens. Talk about crazy!! Fortunately I have some very good friends and a wonderful daughter that are willing to help me out. In honor of Remembrance Day, I am posting my recent painting of red poppies. 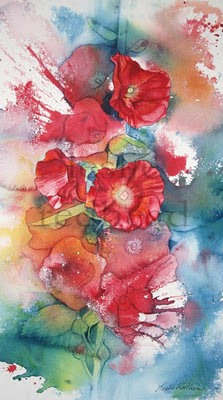 This watercolor is another painting that I did by masking out three of the poppies then pouring, blowing and spraying paint in the background. After the paint dried, I painted the three poppies. Then I "found" more poppies, leaves and buds in the background through negative painting. Yesterday was the last of my skies class. To finish off, I taught the class how to do the above painting. We did 7 skies in the 8 weeks. Some were a real challenge but it was great to see what everyone accomplished. I really enjoyed painting and teaching different skies but I especially enjoyed my students. I must admit that it was one of the best groups that I have taught and I will miss them. This week has been another crazy week. I have my studio tour in 2 weeks and I agreed to do a couple of pouring demonstrations as I continue to teach several more classes. O yes. And the sleepover birthday party for my 10 year old son. A house full of 10 year old boys should be fun. Not sure what I was thinking? I always think I can do more than I actually can. I've decided that I can get it all done if I just cut out the sleep. It would also help if the weather and the car cooperated. Might as well throw the kids into that mix. Maybe I could bribe the 10 year old boys to clean? Hopefully the stars, the universe and everything else will align in such a way that I can get it all done. 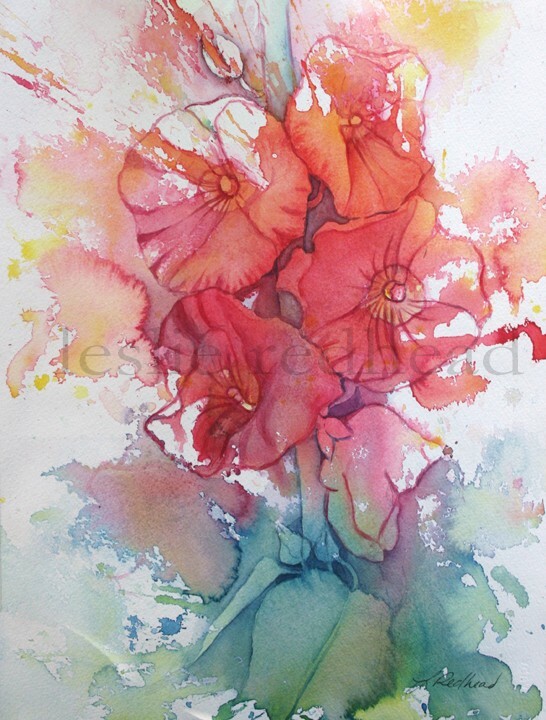 Emma's Hollyhocks is another painting I did with my beginning class. The inspiration for this painting came from the beautiful red blossoms growing in my neighbor's (Emma's) yard. This is the second painting that I demonstrated at Painter's Lodge. 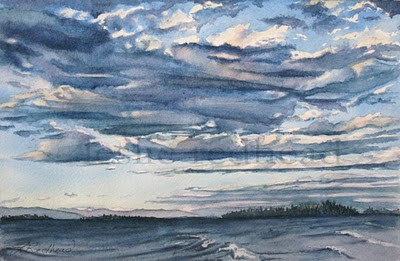 It is from the West Coast of the island and one of my favorite spots to paint - Point No Point. In fact, I have painted this scene before as a plein air painting. 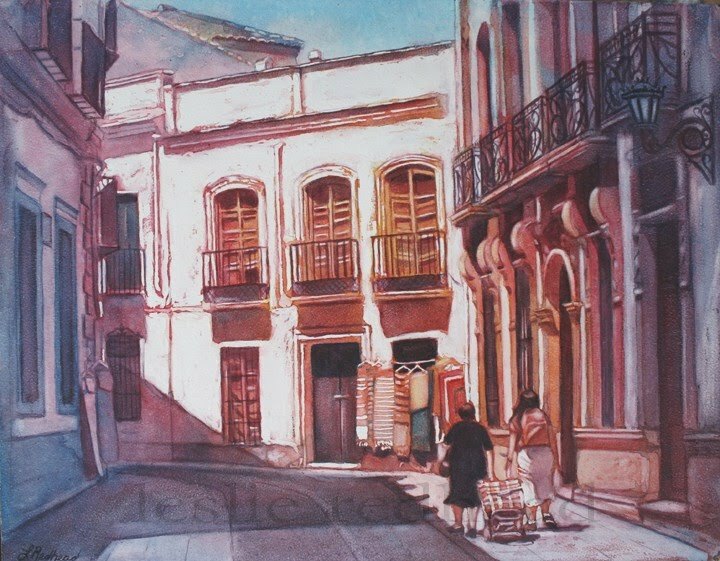 Many of the participants were beginning watercolorists. The goal of my work was to keep it simple enough for the newbies to follow yet interesting enough for those familiar with the medium to try something new. 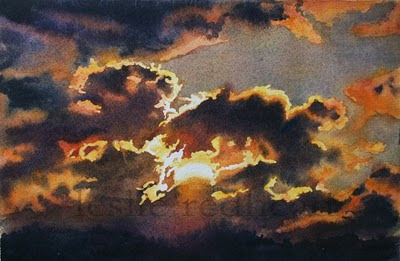 My next painting for my sky class is a sunrise with clouds. 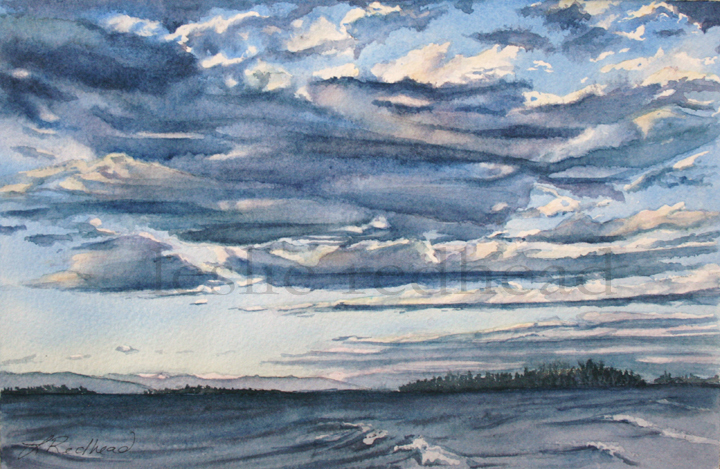 I painted it from a photo I took while on a walk around Oak Bay Marina on Vancouver Island. I started the painting by first wetting the paper then dropping Aureolin and Permanent Rose onto the wet paper. ﻿After this initial wash of color, I let the paper dry. Then I wet it again and painted more of the Aureolin and Permanent Rose onto the paper. This intensifies the color and it starts to create a nice glow. I left instructions with my class to complete these two steps as their homework. Next week I will be showing how to put in the darks. Last week I started teaching my Creating Dynamic Skies in Watercolor class at the Monterey Centre. This painting is the first one that I showed how to do. It is a simple sunrise without any clouds. 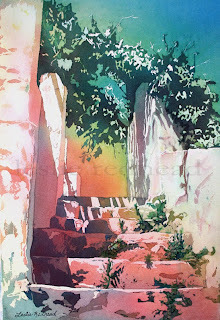 The painting is taken from a photo from my many wanderings around the island. It is the view from Cattle Point in Oak Bay across the water to the mainland. It was so quiet and peaceful that summer morning. No one around except the birds and the seals. 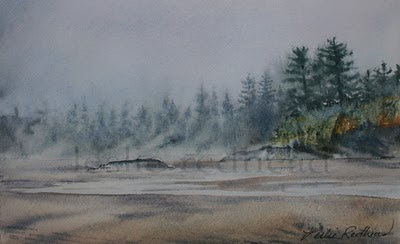 I have been away teaching a workshop at Painter's Lodge in Campbell River, BC for the past few days. I am asked to teach there every spring and fall and enjoy it each time. The weather was sunny, warm, and beautiful. The Lodge is right on the water and we watched the fishermen leave each morning and come in again each afternoon with their catch. We even saw orcas (killer whales) this time and watched them play for awhile. It is only the second time that I have seen them but I imagine that it never gets old. The above painting is the painting that I demonstrated. There were 21 people in the class and each one did an amazing job. 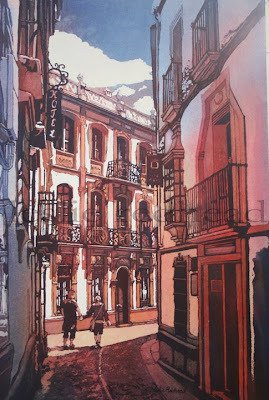 It is exciting to watch someone new to watercolor discover how wonderful it is. I am finally posting a commissioned piece that I finished last week. The family that asked me to do this wanted something from their memorable trip to the Caribbean. I think it is a wonderful way to recall their holiday. It is nice to see siblings that love each other and hopefully they will remember this time as they age. 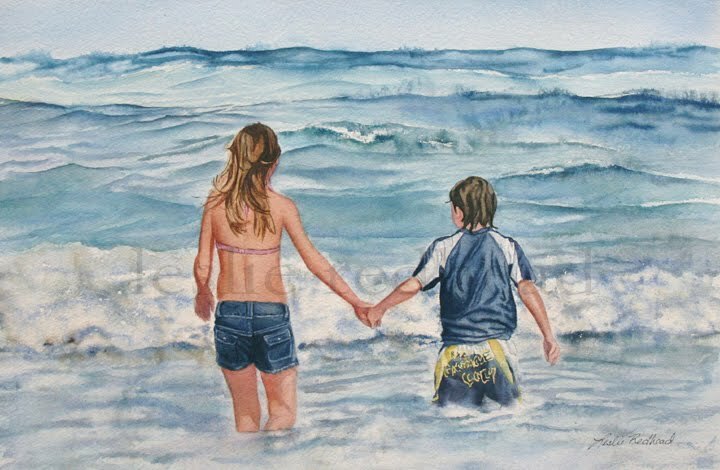 To commission a painting of your loved ones, please contact me. 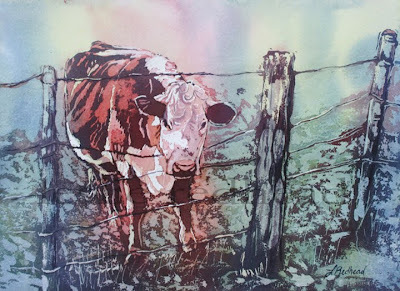 This painting is my favorite out of the cow paintings that I poured (one more yet to come!) She is the cow that lives next door to my friend, Cathy. Cathy lives on a lavender farm on the Saanich Peninsula surrounded by beautiful vistas of the island and the water. 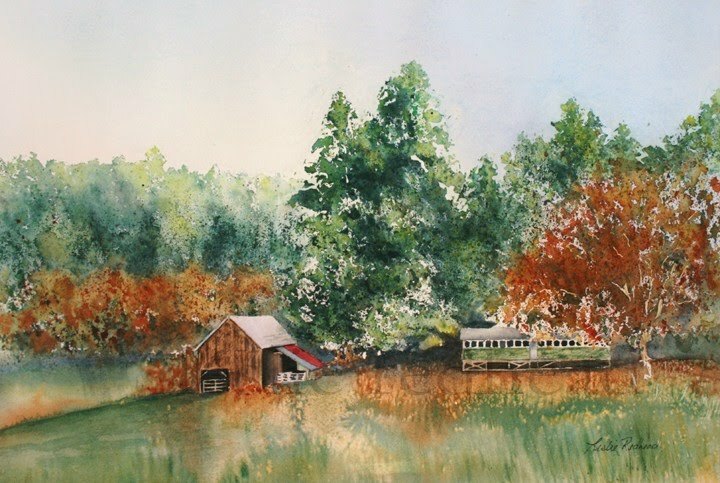 I am lucky to have so many wonderful friends with inspiring places to paint! Now I just need to paint the lavender in bloom. View of the living room and the spot that I painted in. View of the kitchen area and some of my paintings. This past weekend was the Art Gallery of Greater Victoria House Tour. There were 7 homes on the tour. 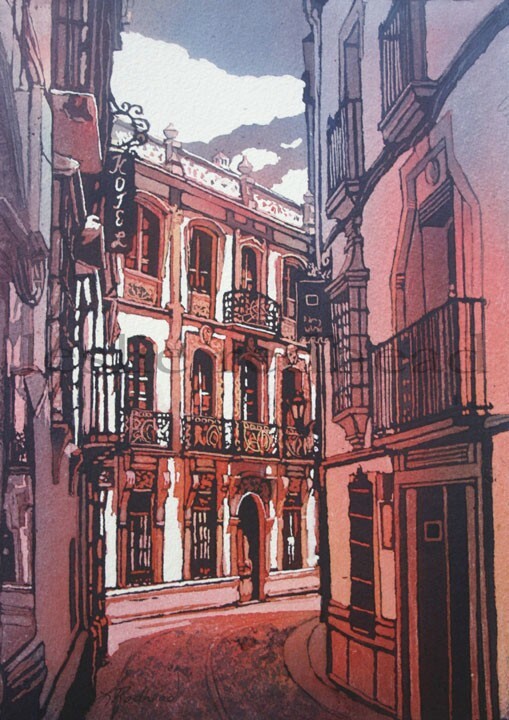 In each home, an artist had been invited by the Art Gallery to display their work and to paint in the home. This year the tour was held on the Saanich Penisula. It was a very wet day but it was still a sold out event. I had never been in this area of the island so had the idea to try to get there earlier than told. I decided to follow the signs for the art tour and ended up at this gorgeous home. The house captain invited me inside and showed me a bit of the house. I was thinking "Yes! This is my home!!" Then the owner came out. She looked me up and down and said, "She's not our artist!" Oh. I had the wrong house. Mine was 2 doors down. Thought that was kinda rude of her until I saw "her artist". Young, handsome, and male! I would have been disappointed if I saw me instead of him also. The house I painted in was a 1960s bungalow that had been newly renovated. The owners had only been in the home for a month and they were very friendly. They invited me in and let me have quite a large space to paint in and to display. The views were fantastic, overlooking the water and onto the other islands. The floor is leather. The kitchen has blue star granite countertops and basketweave glass tile. The master bedroom had a bathtub right in front of the full length windows and the tub was transparent!! Not for me, thank you. The ferry goes right by so I would not want to put on that type of show. I wanted to paint the beautiful view but it was all grey and rainy. Plus I might get carried away and actually paint. Some of the volunteers freaked out when I tried to get water. I was not to leave any water drops in the sink or get any water on the floor. So I painted a portrait very carefully. And talked alot. That being said, I didn't get anything done. Apparently I had the best spot as the artist. I was told that the other artists were tucked away or in the carports. Lucky me. And like I said, the homeowners were wonderful. The best part of the whole day is the phone call I received this morning. 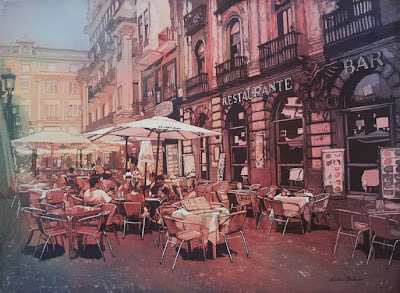 I sold 2 paintings to one of the patrons. Woohoo! 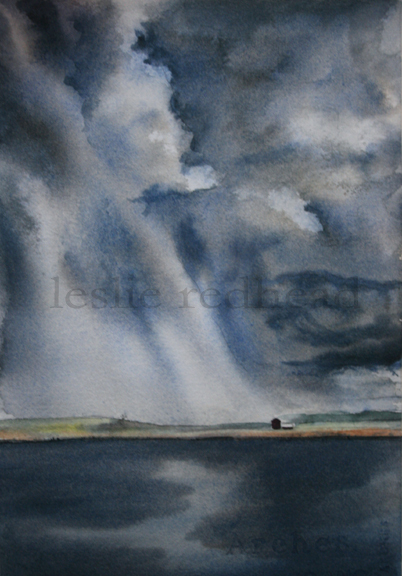 Another painting from my fabulous weekend at the Saanich Fair. 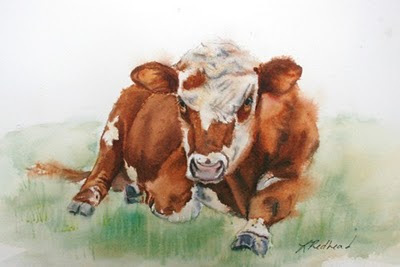 I did a few paintings of cows that are poured watercolors. I really prefer doing buildings as pours but decided to try something new. It is fun to see how it turns out. 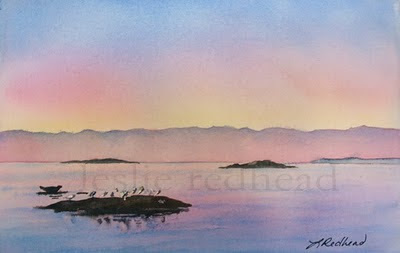 Here is another painting that I demonstrated at the Saanich Fair over the weekend. The theme of the Fair was cows so I was asked to paint a few. This was my first one and I am quite pleased with him. It is so exciting to be an artist. There are so many wonderful things to paint! Now I am tempted to do a whole series on barnyard animals. This past weekend I was the guest artist and demonstrator at the Saanich Fair. 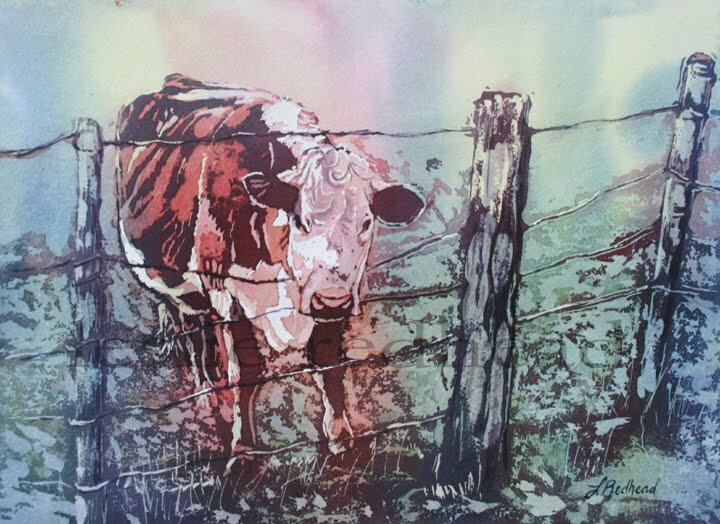 I spent 3 wonderful days painting barnyard animals and meeting other artists and art lovers. 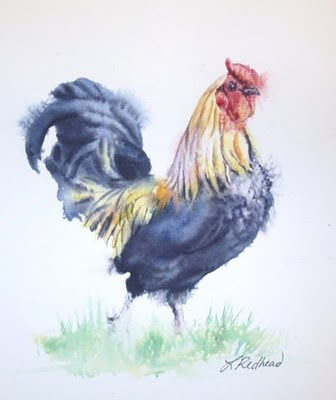 The above painting is one of the many roosters that I did paint. The first one sold almost immediately so I decided to do a few more. I discovered that I really enjoyed painting them with their beautiful tail feathers. 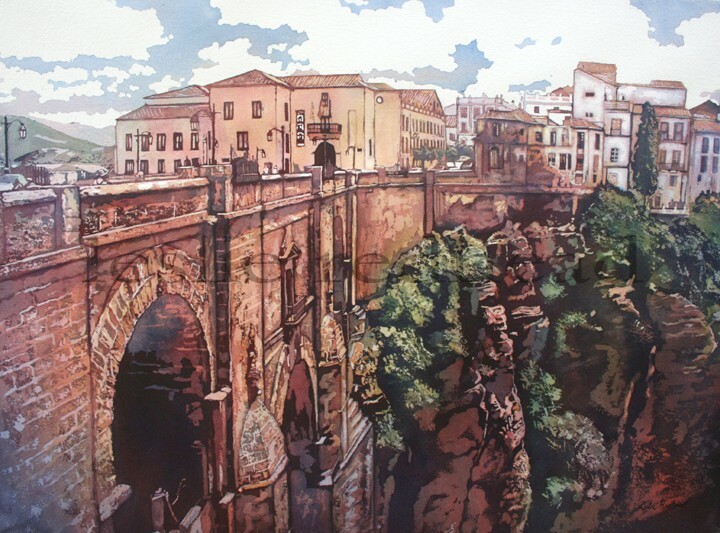 Ronda Today, the awesome tourism site for everything and anything Ronda in Andalucia, Spain has featured me on their site. Andy, the site manager, came across my painting of Ronda and was kind enough to tell me that the painting is of the entrance to Calle Tenorio, which is one of the oldest streets in Ronda. Thank you Andy for including my work on your site. To view the article, click here. 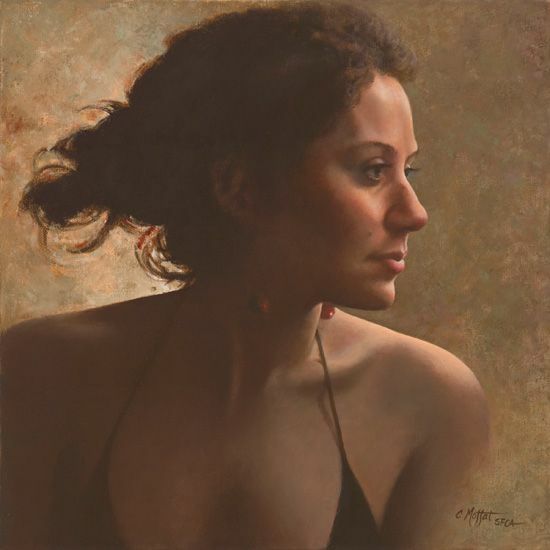 To purchase the painting, please contact Madrona Gallery. Point No Point is one of my favorite spots to paint. It is on the west coast of Vancouver Island near Sooke, BC. I am fortunate to be able to teach a workshop at a B&B (Ocean Wilderness Inn) close to this area. 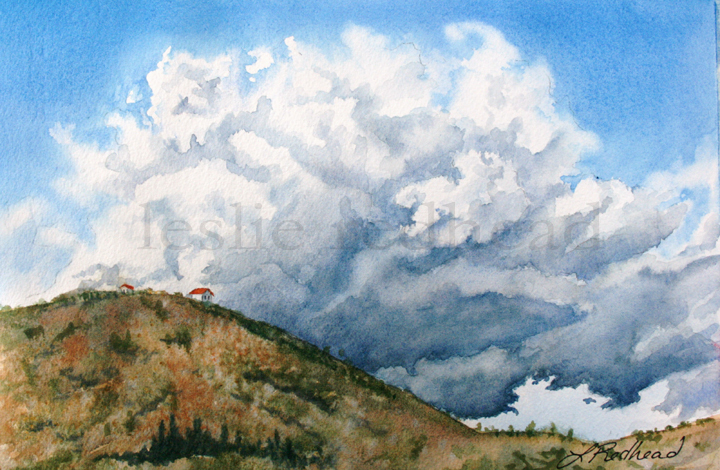 I always try to make it a part of my workshop (weather permitting), either to paint or to get photo references. The restaurant is also fabulous and a great place to relax. The bridge is red and is built on a huge log that connects the point to the mainland. It is just a narrow strip of water that separates them. 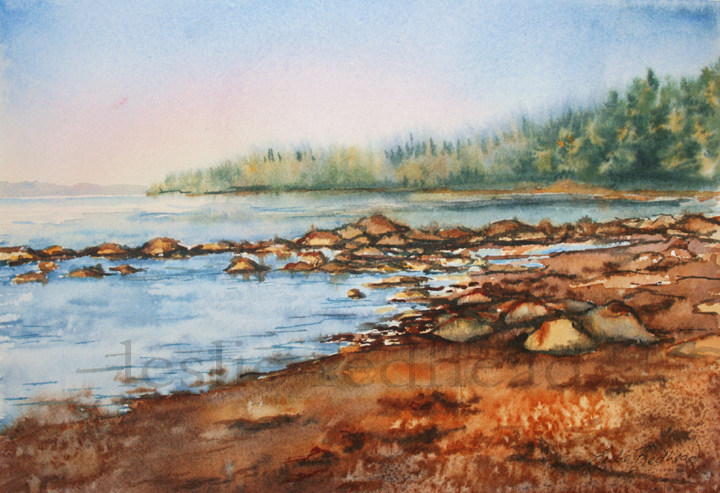 My next workshop at the Ocean Wilderness Inn will be Oct 1-3. I taught a workshop on watercolor landscapes just over a week ago.This is one of the paintings I demonstrated. 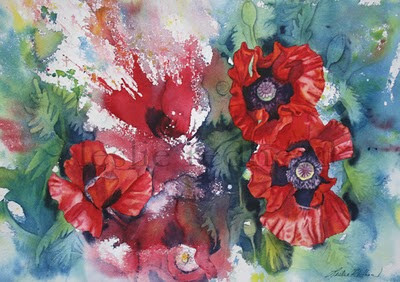 It is done from a photograph I took while in Spain of olive trees and poppies. We were in Andalucia at the end of the poppy season but there were still many of them out. Here it is! The video of the pouring process that I promised. I was so excited to show everyone the BIG REVEAL that I am posting twice in one day! So this is what it looks like after I pulled up the masking fluid. I will now clean up some lines and fix a few things that are bothering me. Not much to do but enough to hopefully make it a real "wow". This is the result from my last and final pour. For this I just used my red and my blue in an even more concentrated form. I am so excited to show the Big Reveal that I will post it very soon. For my third pour, I masked out my next value by following my black and white photo. These values are more midtone since I am at the midpoint of my pours. The paint was made into a liquid only I made it slightly more concentrated than the last time. I rewet the paper and poured again. I also use a medicine dropper to drop in the paint where I want it to go, such as yellow and blue on the left for the green palm trees. I had completely forgotten to photograph the 3rd pour. Thank goodness my daughter had it on her camera. She is videotaping the process for me. If it turns out, I will post it. I was so anxious to pour again that I started to mask before I took the photo after the fourth pour! The painting is starting to take shape. Just one more pour!! Then the big reveal. 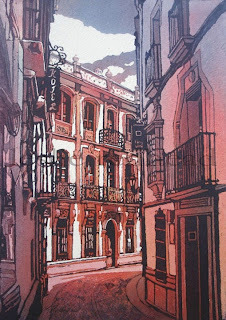 Here is the result from the second pour I did on the Cordoba Cafe. After I let the first pour dry, I masked the next values (these are light values). I use a black and white photo to help me do this. So in this case, it would be pale greys that I mask out. After the masking fluid dries, I mix up my 3 colors again to liquid form. They are slightly more concentrated than the first pour. I rewet the paper using a hake brush then I pour the yellow and red paint, let it mix on the paper and pour it off. Immediately after, I pour red and blue in the corners again, mix, and pour it off. Once again I let it dry before I mask again. 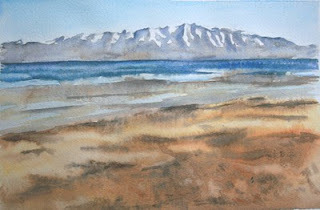 At the request of many, I am posting another painting as I go through the process of pouring my watercolors. My daughter and friend are videotaping the process as well and I hope to have it done by next week. In the meantime, you will have to be happy with stills. The above painting is of an outdoor cafe in Cordoba. 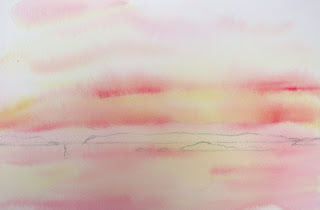 I start by stretching my watercolor paper (Arches 300lb cold press) to a board and drawing the image onto the paper. 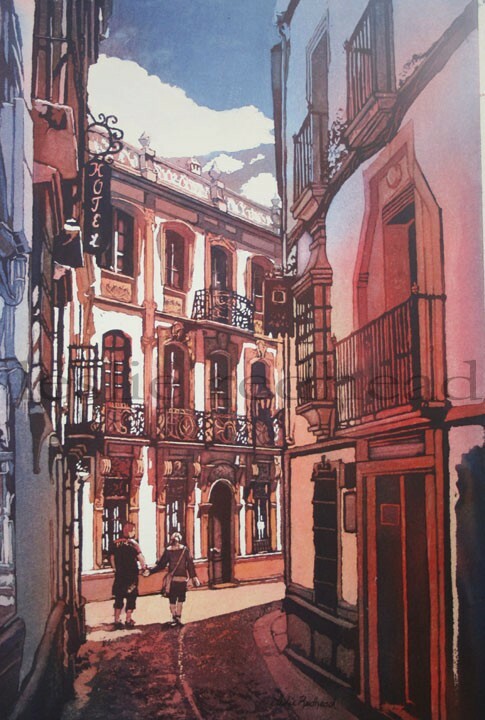 I then used masking fluid (Winsor & Newton is the best) to save my whites (the umbrellas among other things). 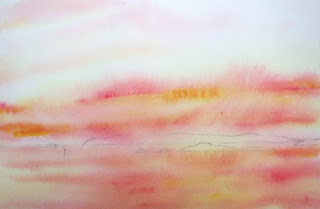 My paint ( 3 primary colors that are staining) is mixed to liquid form that is light in value. Next I wet my paper with a large wash brush. Since the paper is wet, the paint will flow easily. On this painting I started with yellow (Aureolin) and poured it across the surface. Then I poured my red (Anthraquinoid Red) next to it. I moved my board around so the colors mixed and then poured it off. Immediately after this I then poured the red again and my blue (Indathrone Blue) in my corners, moved the board to mix, and poured it off. I let it dry overnight and the above photo is the result. Now I will mask the next value.